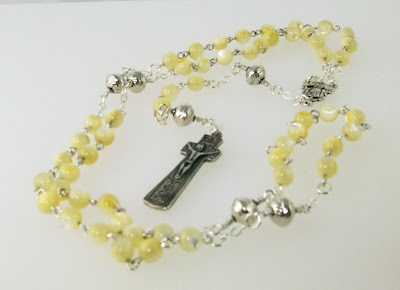 This lovely rosary beads was gone almost as soon as it was made. I love the combination of this soft aqua colour and the bronze. I also like that the cross does not have a corpus hanging from it, something that upsets my children! 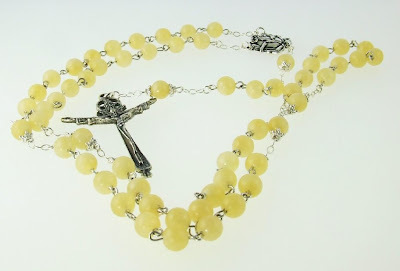 Yellow rosary beads - a ray of sunshine! 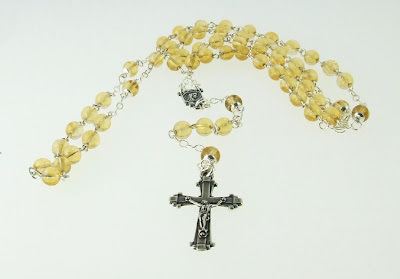 I wrote some time ago about a request for yellow rosary beads. I'm very happy with the results. 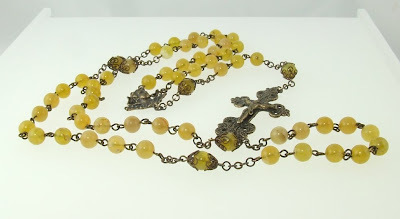 My lovely online friend Francesca from Canada chose the 8mm yellow opal with brass and bronze, definitely the most dramatic-looking of the items I had made, and it will soon be winging its way to Italy to the lucky recipient. 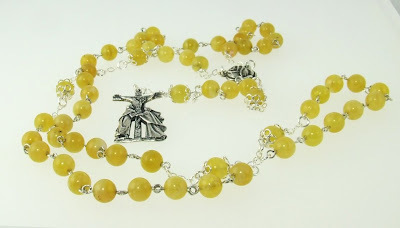 A similar 8mm yellow opal bead with silver and a lovely "Foot of the Cross" crucifix featuring John and Mary. The rose centre has the classic picture of St. Theresa of the Roses on the reverse. 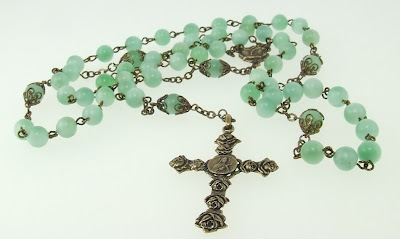 There is a matching cross which I have used in another sold rosary, in bronze, which I will post shortly. I do love working to request, it seems to bring out my inspiration! 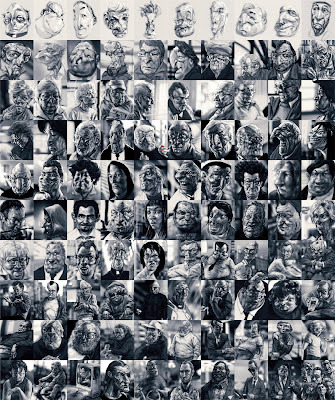 My good friend Stephen has just completed a 100-day run of posting a caricature a day, and has combined them all in this shot. For more detail follow the link in the title.